I see, thanks for explaining that! There are some small cab marks on the hood but otherwise nice condition. Your 856 is in great shape as well. I like your steps! Maybe he is trying to make money farming, heaven forbid to be on a budget! Thanks but I am not sure what you mean by the paint. My friend and I drove 6 hrs to look at it. I am at least the 3rd owner of it . It runs and sounds great. My friend and I believe it is the original paint as everything front to back is the same condition. I really like it too. I just bought it and hr east of Sioux Falls on craigslist. 1086 Rear end hot when running discbine. That's just fine, the more info i put out somebody might have a some experience to share. Like you did when you questioned it. I like that. I really like the 504 PRO. 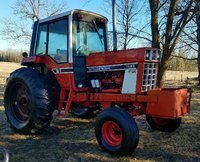 Bought it with 12000 bales threw it and its 2013 in good shape. It makes a nice bale after I got it figured out. I need to look at the spool valve like you said. Thanks again. I will have to take a look at that, I had to use the old bungee strap routine. Its in the manual. Not sure why but it says it multiple times. Western Interior -What’s Different From The Standard Interior? I will check for that when I get home, week or so. thanks for the help! I have a this, not sure if it's a custom paint job. 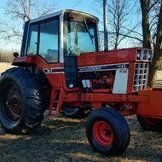 I have not seen it on any other tractor, has anybody? My floor is red, my cab kit was black and my seat is brown. It was about 85 deg and i think its a open center. I have no levers below the hydraulic levers. The float is for my baler. Its a Vermeer 504 pro and it calls for the pick up and bale eject to run in float. I thought that might be what they are for but the tabs do not stay out. I did wash and clean everything with a power washer and I could see threw the radiator. This was my first haying season with all new to me equipment . When I felt the rear end axle housing of my 1086 it was hot enough that I could not keep my hand on it for more than 3 seconds or so. The Hydro oil level is were it needs to be. I just thought is this too hot? Its running a 1431 NH. 1000 PTO with 3 remotes being used. My only other problem is that I cannot keep the remote spool leavers in float for my baler. What are the pull out tabs when you push them all the way forward for. I would assume the float would have a detent to hold them? Started the 1086 up today and ran it for 35 min with a temp at 16 deg F. It idled and drove about 300 yards. When I got in to move it I pushed in the clutch for 2 seconds and the lube light comes on and drops out just before the tractor moves. I have never been able to get it to come on other then when the tractor fires up. The hydro fluid is cold so that is the only thing different. Any thoughts?